The wholesale marketplace has been growing exponentially! Here’s a quick guide for how the Kush Marketplace works, and the best way to close deals. If your sourcing material in the legal cannabis landscape, there’s no downside to using the Kush Marketplace. When you find a product you’re interested in you can either request more information, choose to ‘Buy Now’ at full price, or make an offer. 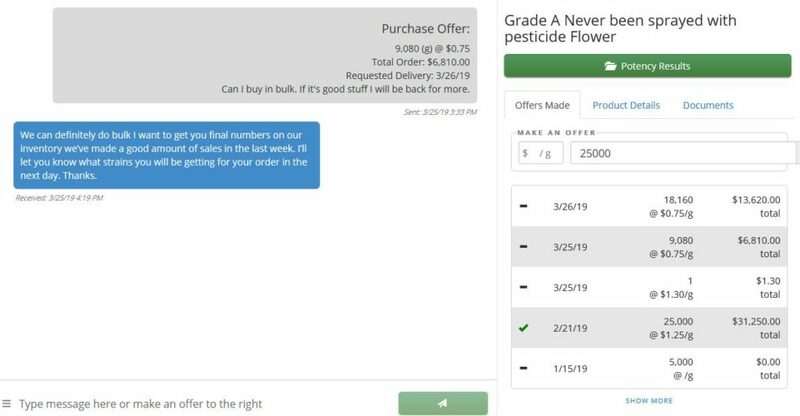 All actions will open a direct chat box where the seller can respond with more information, or accept/counter your offer. 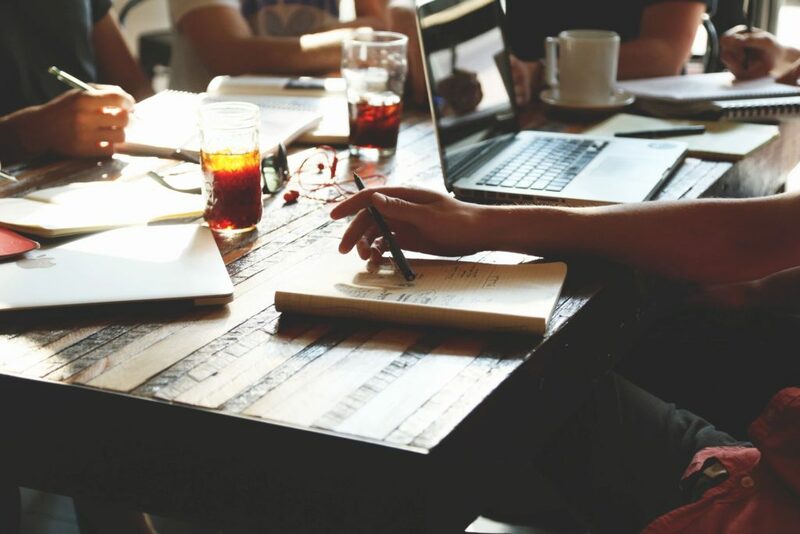 After we’ve verified your seller, we’ll send an introduction through the conversation containing the company and contact information provided for both parties. From there you’ll have everything needed to treat the deal like a normal cannabis purchase. The Kush Marketplace is the best place to connect with a great number of buyers fast. Post your products for free, even one picture and a strong description is enough to get started. As buyers make offers or information requests you’ll receive email alerts, and can view all the ongoing conversations from your ‘Conversations’ page. 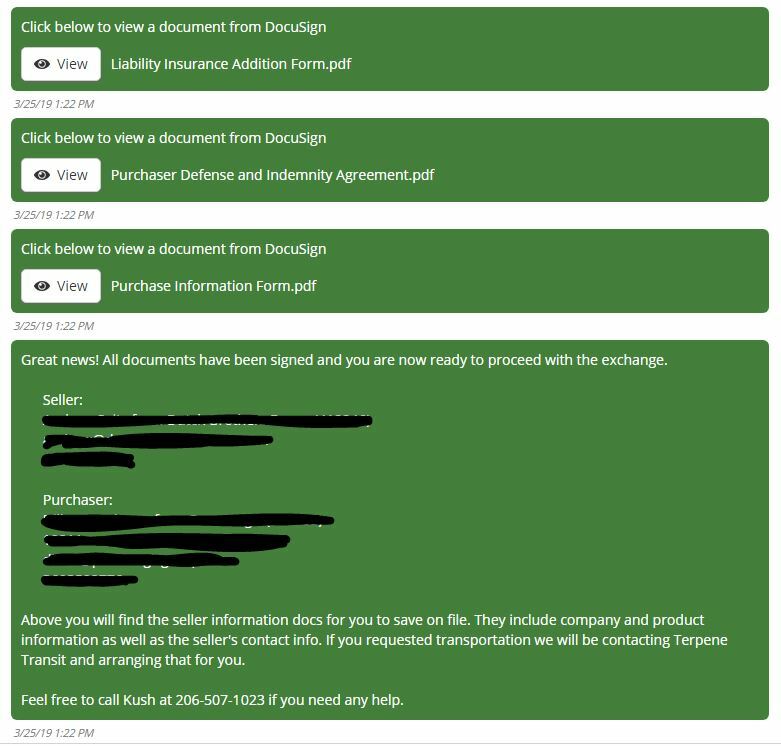 Once a sale has closed, Kush will send over a few forms by DocuSign. They’ll list our fee, found on the Terms Page, and have you provide basic contact and company information. From there we’ll send order confirmation with the company and contact information provided for both parties. Now you can treat it like any other sale! Keep in mind we won’t send our invoice for fees until delivery is complete, this way we can account for any returns or rejections. If there’s no deal, there’s no fee. The Wanted Ads section lets buyers post exactly what they need, and allows sellers to be proactive. As a buyer, you can post a wanted ad for whatever your current sourcing needs are. You’ll see all of the current matches and have new producers compete to fulfill your request. Sellers with fitting products can send you their listing, complete with pictures and description & prices. From there you have direct communication with the motivated seller and can make offers or request further information. As a seller, this is the best way to be proactive and seek out hungry buyers on the Marketplace. 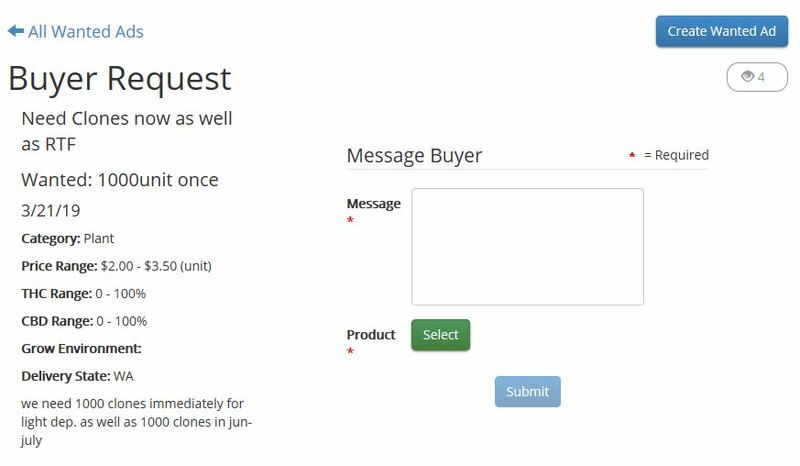 Post your product as normal, and if you see a wanted ad that fits, you can send your product directly to the buyer. A chat box will start and you can close the deal from there.